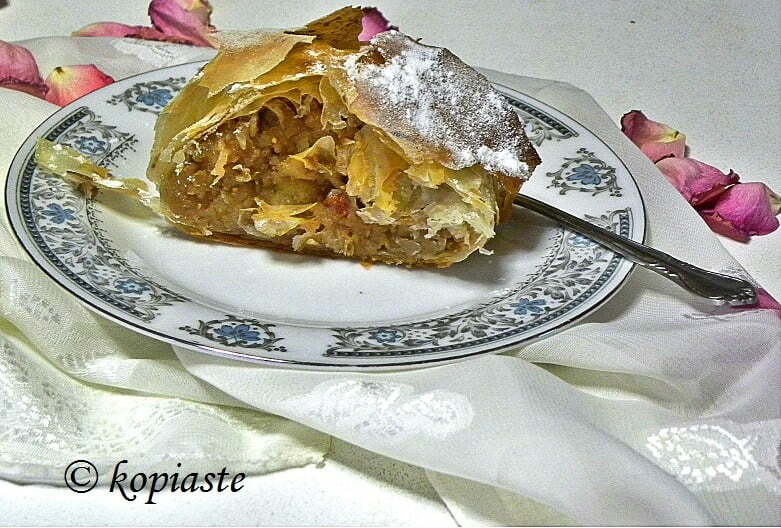 Apple Strudel is a dessert which originated in Austria but is popular in other countries such as Germany, Hungary, etc. The word “strudel” in German literally means whirlpool and is named after the shape it takes when thin strudel dough encloses the sweet fruit filling, usually made with apples, sugar, raisins, nuts and cinnamon. I’ve made strudels many times and since I have not posted any recipes yet, today I am posting two of my recipes. In both recipes I have cooked the apples first. One is made with homemade tart dough, with coconut in the apple filling and the other one is made with leftover phyllo, after making again my Baklavas Tart with Chocolate, in which I have added some of my last year’s homemade fig jam. Prepare the dough and divide it into two pieces. Wrap each piece with cling film and leave it in the fridge for half an hour or until the filling is ready. Preheat the oven to 180oC and toast the walnuts or almonds. When they slightly cool, coarsely chop them. Soak raisins in brandy, until they become plump. Strain them and reserve the brandy. Peel and core the apples and put them in a bowl with water and lemon juice to prevent them from oxidizing. Then cut them into thin, smaller slices. Heat the butter in a large frying pan, add the sugar and mix until it starts to caramelize. Add the apples, stir, and pour the brandy. Cook briefly until the liquid has evaporated. Add the cinnamon, lemon peel, raisins, nuts, coconut and mix well for a few minutes. Set aside to cool. Roll out the first sheet between parchment paper and spread half the filling. Shape into a roll, making sure that the sides are sealed. Do the same with the second roll. Place them on a baking sheet lined with parchment paper and lightly score the top. Mix egg yolk with milk and brush the rolls. Bake for about 40-50 minutes or until golden brown. After slightly cooling, transfer them to a platter and sprinkle with powdered sugar. Serve the strudel warm, preferably with a dollop of ice cream or whipped cream. My favourite apples when making apple pies are Granny Smith and Golden Russets, known in Greece as “Mila Tripoleos” or “Pilafa Delicious” which add a lovely tartness to the pies and hold their shape. In order to reduce the volume of the apple, so that they may be easily rolled, I decided to cook them first. In the second recipe that follow, I also grated them and lightly squeezed them to removed most of the juices, so that the phyllo does not become soggy. I got one glass of fresh juice packed with vitamins which is perfect to give to your children. In order to make the strudel with phyllo, you will need six sheets of phyllo. As I only had four and lots of pieces, I used the 2 sheets as the bottom layer, added half of the pieces scattered on top but making sure that each piece is well buttered. I added the filling and continued adding the remaining two as well as the leftover pieces . I folded the sides to secure the filling from oozing out and made the roll. It’s advisable to lightly score the pieces before baking as you can then easily cut the slices. In my rush to finish quickly I forgot to score it on top and when cutting the pieces the phyllo crumbled and broke. Peel and grate the apples on the big holes of a box grater. Drain part of the juices. Put 50 grams butter, sugar and a pinch of salt as well as apples and cook until all the juices are drained, mixing regularly, for about 15 minutes. Add spices, mix in the jam, almonds, walnuts and raisins and set aside to cool. Melt the remaining butter either in the microwave for 1 minute repeating until it melts completely or in a small frying pan. (The milk solids will stay at the bottom of the bowl and we will use only the oil). Brush 3 sheets, placing one on top of the other (or use two sheets plus half of the leftovers). Add the filling on the long side, leaving about 2 – 3 cm on each sides. Repeat with remaining 3 buttered phyllo sheets (or 2 sheets and leftovers) on top. Fold the two edges over the filling and wrap the strudel making a roll. Lightly score the phyllos into portions and brush with butter on top. Bake in a preheated oven to 180o C / 350o F for about 30 minutes or until golden on top. Sprinkle with icing sugar on top. Filed Under: Desserts, Easy Recipes, Leftovers, My recipes, Pastries-pies-tarts-crumbles Tagged With: apple pie, apple strudel, BHMAGourmet, Leftovers, vgfoodblogawards, Vima Gourmet Blog Awards, vimagourmetfoodblogawards. It must have been more than a decade since I last had this Austrian classic dessert. Yours look marvelous, Ivy. Heavenly! I wish I could have a slice of this strudel right now.